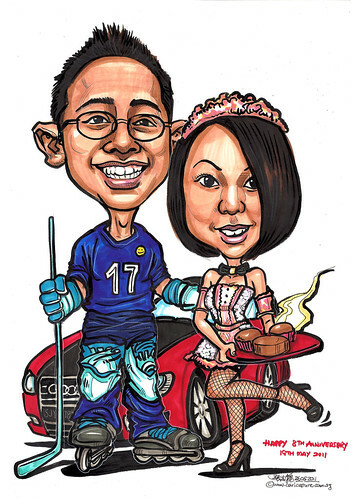 My idea is background with our car, my husband will be a roller hockey guy with roller blades, jersey anda hockey stick as for me i will be a housewife that love baking muffins.... Able include the name "Happy 8th Anniversary 19th May 2011" at the bottom? Forgot to add some more details the number 17 in front of his jersey no need to be too big, can see the number can already and you can design some logo in front of his jersey too....... , as for me i would prefer a French maid uniform with color pink and white with the head band too... and of course holding a plates of muffins and cake....."